Napoleonics is a period with a lot of interest for wargamers, and many of our club members have Napoleonic armies (mostly 15mm but there are some 25s around). The most recent set of rules to get our attention is the Field of Glory FoG-N rules. In past years we played a lot of Principles of War 2nd Edition Napoleonic rules, and we had a few campaigns involving quite a few club members, and the occasional multiplayer scenario. 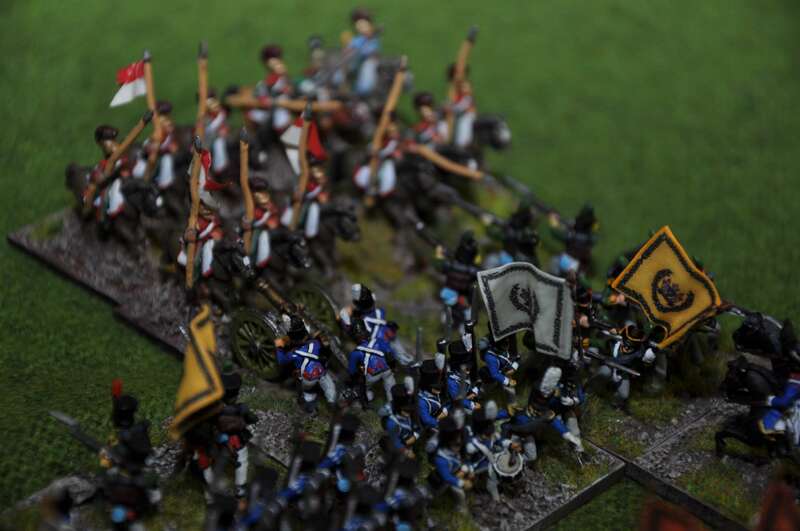 Before PoW, Napoleon's Battles was played quite extensively, and back in the 70s and 80s the WRG 1685-1845 set was popular. That was the days of plastic Airfix armies! FOG-N was first run as a demonstration game at NatCon 2012 and has regularly appeared at Natcons, NIcons and Battlecry tournaments since then. 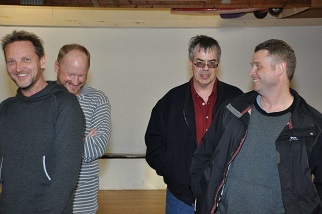 Here are a few pictures from NatCon 2015. 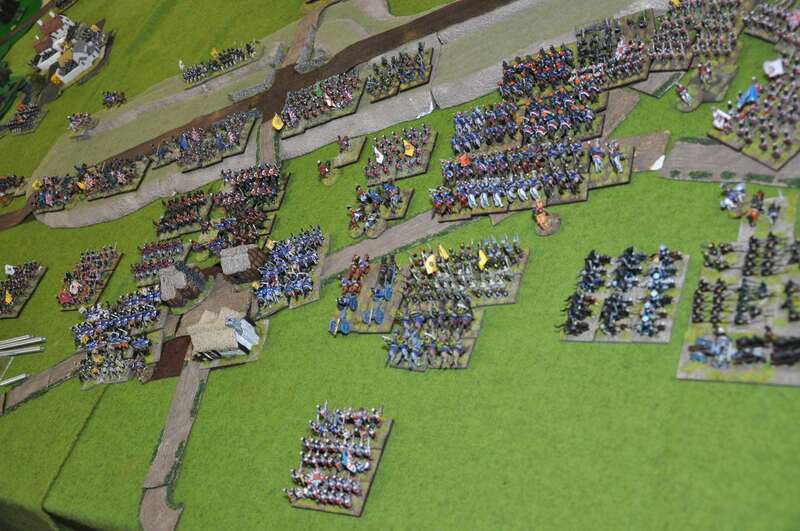 The 1815 Anglo-Netherlands army begins its advance on the defending Russians. The Scots Greys from the other Anglo-Netherlands army attacking the Russians. Lots of French conscripts swarming towards the Russians. We have done several refights of Waterloo using the Field of Glory rules. 8. 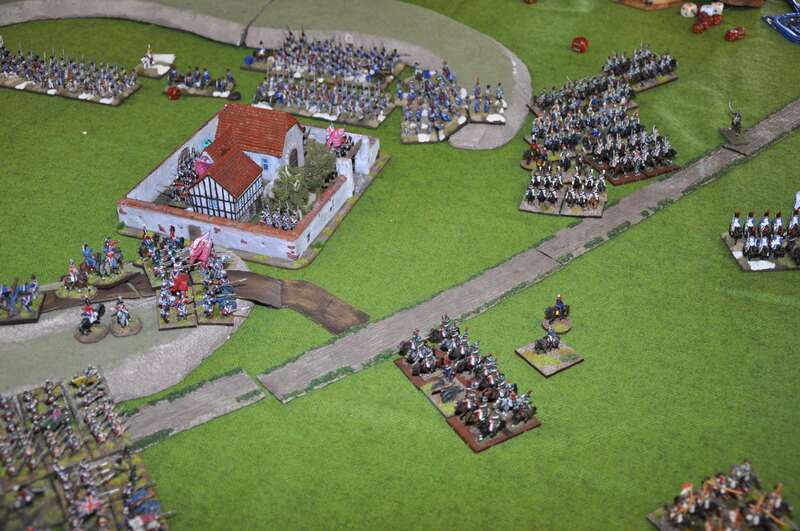 Close up of lancers trying to skewer infantry in square. They failed. 9. 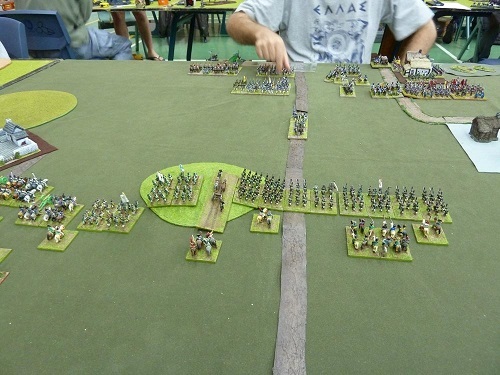 The developing French left hook by cavalry around Hougoumont. The British Guards are forming up south of the chateau. 10. The French Grand Battery moves off its ridge and moves close to La Haye Sainte, which comes under tremendous artillery fire of 80 guns, the Kings German Legion garrison are pummelled. 11. On the Allied left flank, thinks are quiet as D'Erlon's corps redeploys to face the Prussians. This is Papelotte. 12. 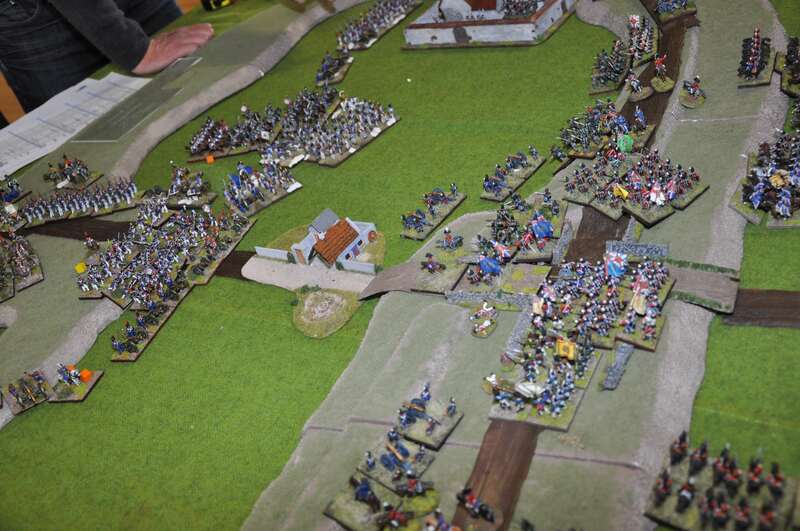 The KGL are evicted from La Haye Sainte after holding under impossible odds from the massed French artillery fire, routing up the hill, but seeing Wellington in person, rally on the ridge. Four horse gun batteries from the Reserve form up in the valley to hold back the French infantry. 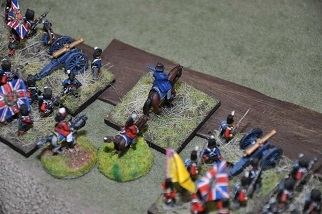 Lambert's Brigade is following them after Wellington commits his reserve. 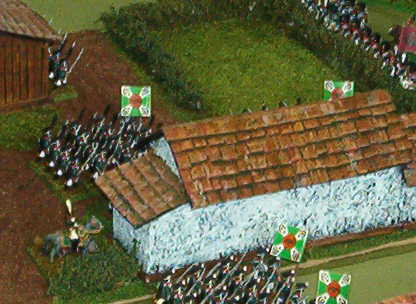 Bijlandt's brigade has been thrown back but has reformed on the ridge's road. 13. The Prussians start pushing through the woods against D'Erlon's troops. They do well and throw the French back. The Prussians effect a link up with the Allied extreme left. 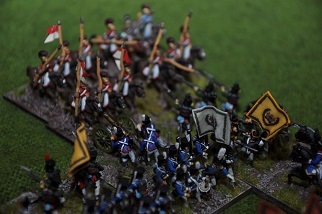 Unlike in the real battle, there was no blue-on-blue fire between the Prussians and Brunswickers. 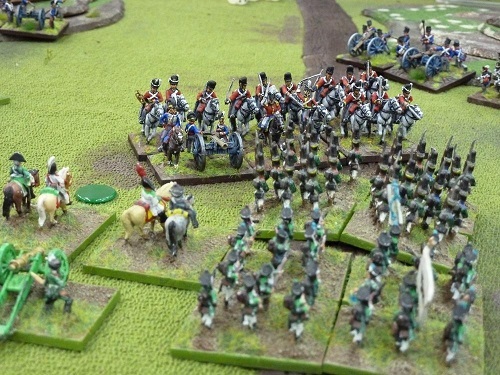 A British Hussar brigade threatens the French flank. 14. 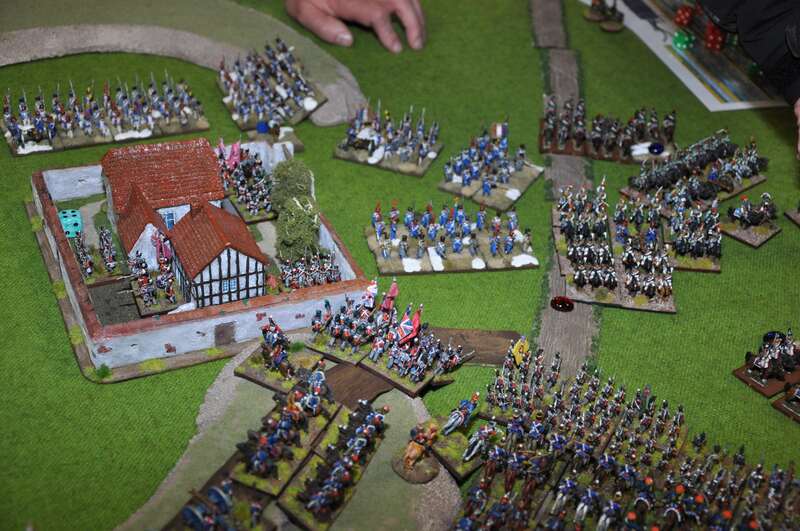 The French prepare to occupy La Haye Sainte with an infantry brigade. 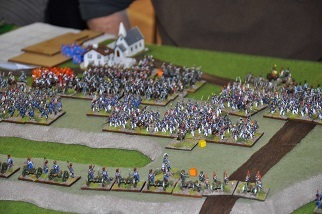 French heavy cavalry starts deploying behind the French infantry in the valley. 15. 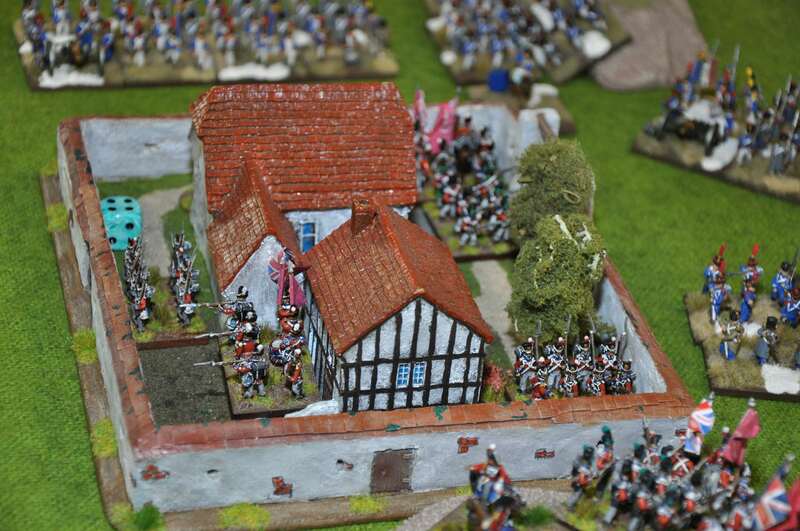 The French swing around Hougoumont but face strong Allied forces, including two brigades of British Guards. The Foot Guards light companies still hold the chateau. 16. The French swing around Hougoumont but face strong Allied forces, including two brigades of British Guards. The Foot Guards light companies still hold the chateau. 17. 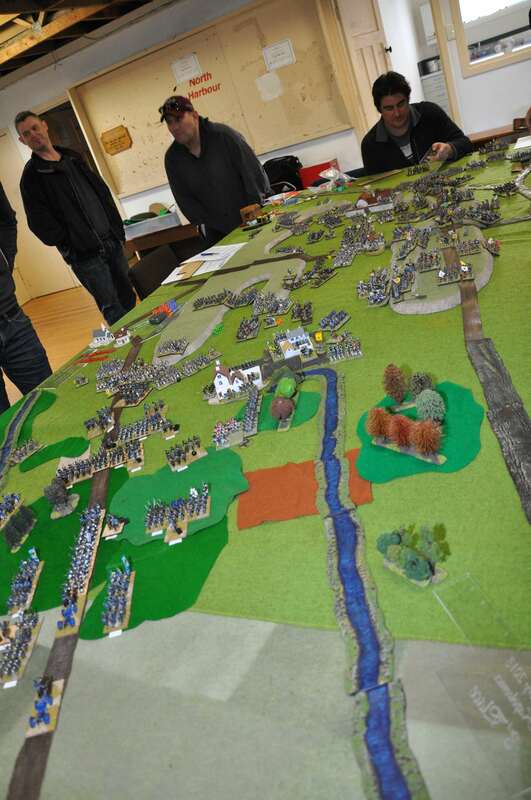 The French prepare to occupy La Haye Sainte with an infantry brigade. French heavy cavalry starts deploying behind the French infantry in the valley. French infantry columns are seen marching up. 18. 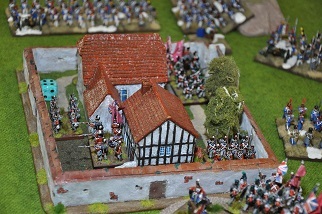 In Hougoumont, the British Foot Guards continue to harry the French manoeuvring near the chateau. 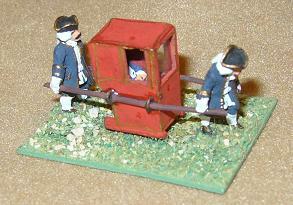 Although coming close to running out of ammunition, a brave Royal Wagon Train driver delivers a tumbril of ammunition in the nick of time. 19. 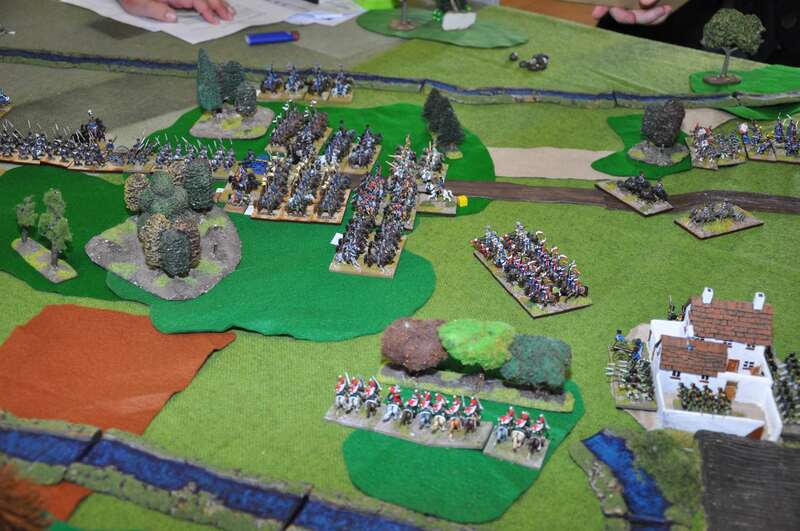 A long shot looking east, showing the Prussians pushing through the wood and driving the French back to the base of their ridge. 20. A general advance from the British ridge as light cavalry brigades and Picton's division move across the valley to the weakly held French ridge. The French Guard are only just starting to move. 21. The French cavalry brigades on their left collapse under close range volley fire from British infantry. To shouts of "Remember Minden!" the steady musket volleys empty French saddles and drop horses. 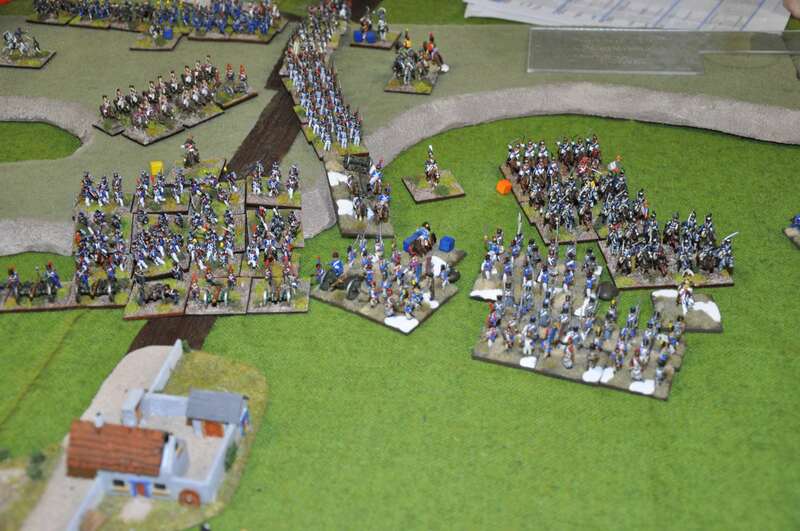 Under such close range fire, the cavalry break and flee - even the Gendarmes d'Elite. 22. The French collapse. Their left flank gone, their losses were so great and the allies' so few, that their entire army collapses. 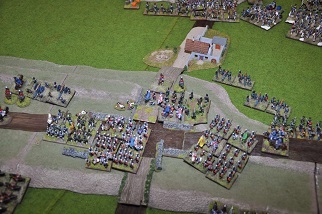 Napoleon is shot against the wall of La Bell Alliance by enraged French Old Guard. Europe is saved. 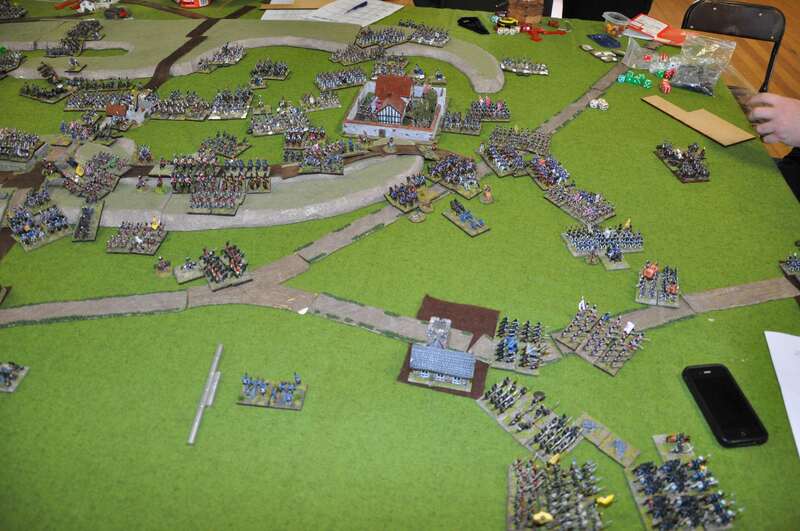 2011 refight During the playtesting phase of FOGN in 2011, we had a game with seven players involved, using 4300 points of French, 3200 points of Allies and 1900 points of Prussians (of whom only about 600 points arrived on the table). 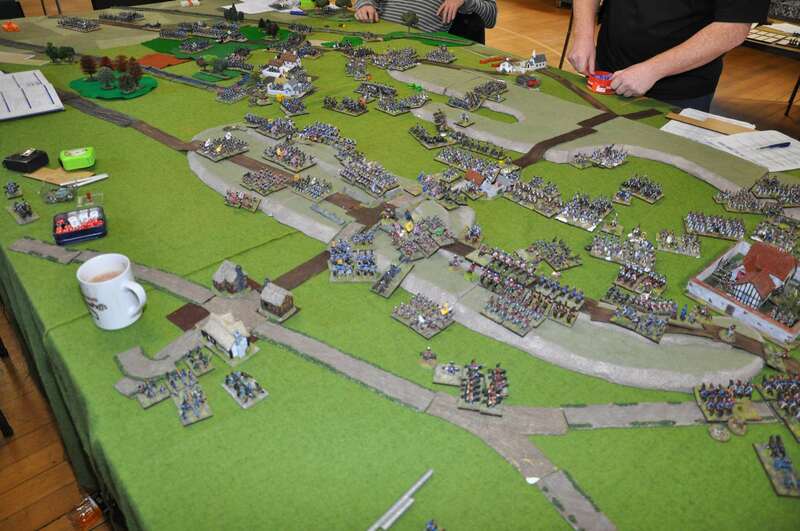 Many of the figures had only recently been painted and based, and the terrain was specially constructed for the game. 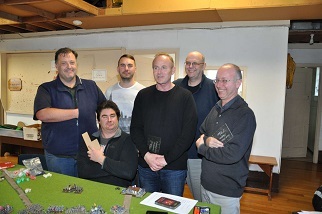 We played from 9am to 9pm with some meal breaks, and had a great game. The first picture shows the whole battlefield looking from the east. In the foreground are Frichermont and Papelotte, La Haye Sainte in the middle, and Hougomont at the top of the picture. 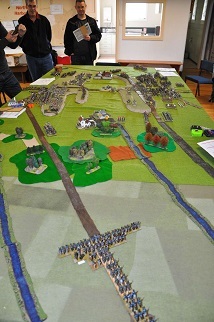 The French army is deployed on the left, with the Imperial Guard just arriving. On the right, the ridge of Mont St Jean is defended by a thin line of allied infantry, with cavalry and reserve infantry behind them. 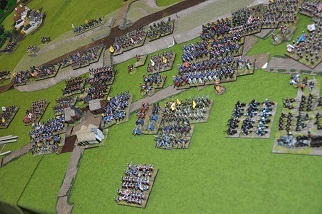 The other picture shows the French infantry formed up to begin their attack on Hougomont. The battle began with French assaults on La Haye Sainte and Hougomont, which were eventually successful after a lot of hard fighting. French heavy cavalry moved to the west of Hougomont, engaging and defeating the allied cavalry and British infantry who moved to face them. A Netherlands infantry division from Braine l'Alleud arrived in the midst of the cavalry fight, and then spent most of the battle in square. 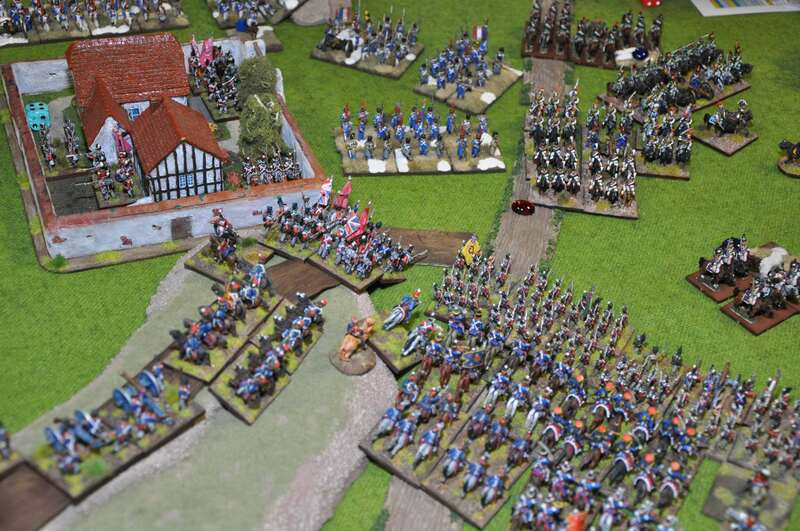 After taking Hougomont, the French pressed on and assaulted the ridge with the Imperial Guard. A counter-attack from the British guards momentarily repulsed them, but they reformed and took the ridge. 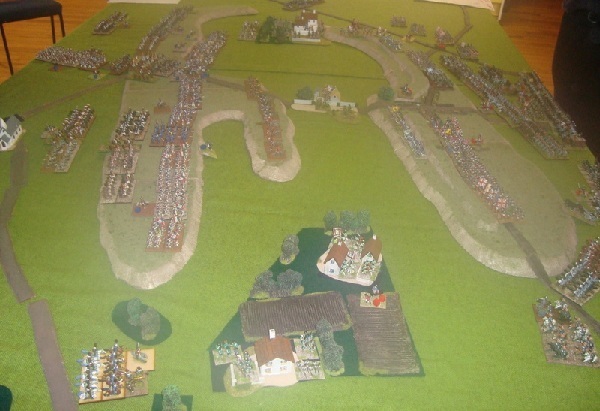 While all that was happening, the Prussians were marching to the battlefield, struggling through the muddy roads and abandoning their artillery. They arrived in the vicinity of Fichermont which was still held by the Nassau regiments. The German forces then attacked the French right flank, breaking d'Erlon's corps which had been unengaged to this point. Too late! The allied army had broken by then. All in all, an excellent club project, and one that we will be repeating later this year. 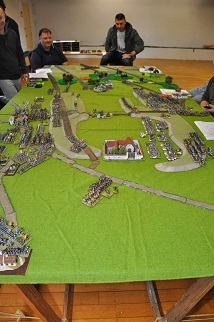 A battle between the Prussians and French, using the Field of Glory Napoleonics rules with our newly rebased armies! The French had the initiative and deployed with a division of drilled infantry defending two villages in the middle of their deployment area. Their other veteran infantry division and cavalry division were on the other open flank. The buildings in the picture look rather Middle Eastern, but this was the French Army of the Orient! 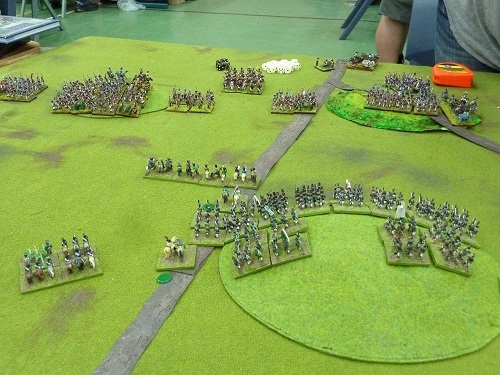 The Prussians had most of their infantry facing the villages, with the cavalry on the open flank and some infantry in support in a nearby forest. 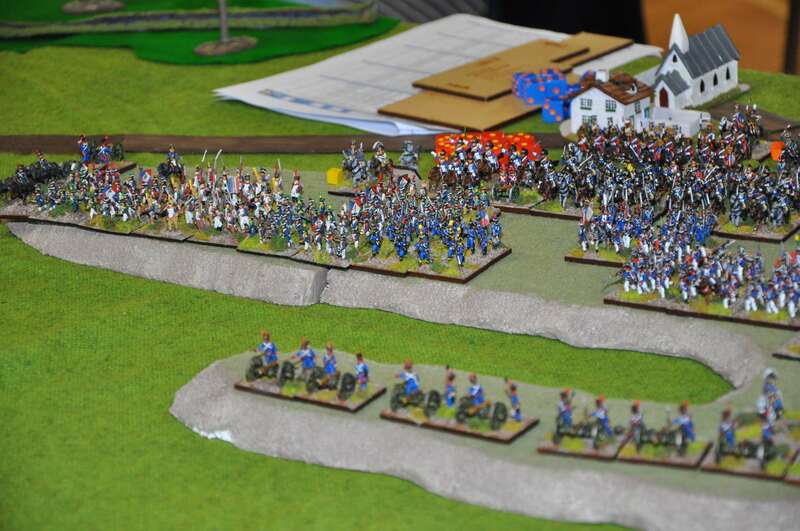 The game began with the French artillery battery advancing up the central road. 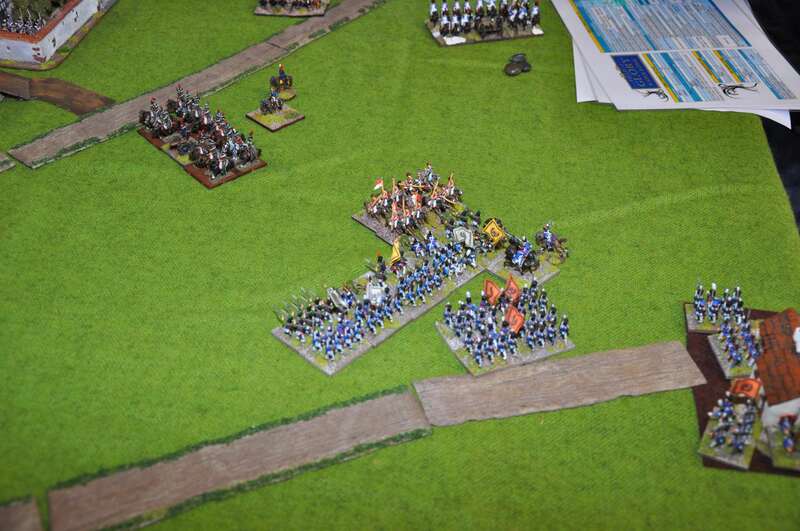 The first long range shot from the large Prussian battery got 4 hits, and the French rapidly retreated! 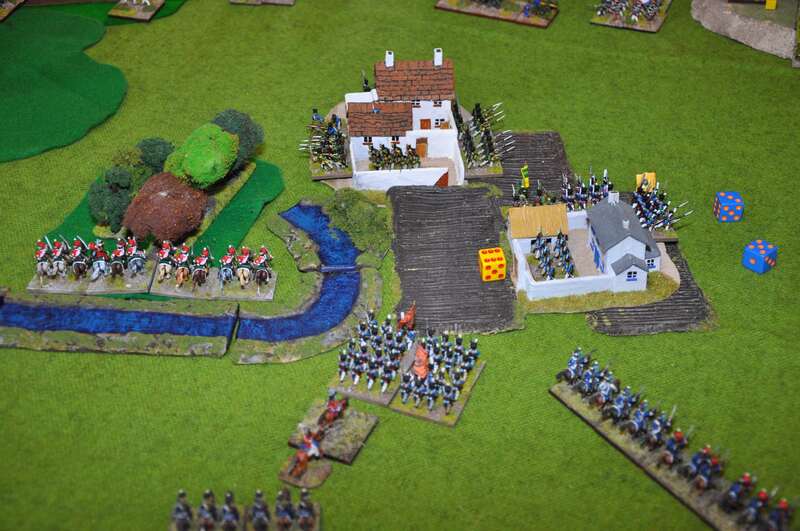 The French artillery spent the rest of the game redeploying to the other side of a village, but didn't feature much in the rest of the game. What appeared to be overwhelming hordes of Prussian infantry advanced on the French position which was anchored on two defended villages. The Prussians adavanced with high spirits singing patriotic songs, but were unable to take the French positions. 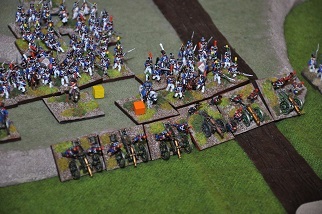 There were several times that French units were wavering, but they managed to rally in time to hold off the attackers. 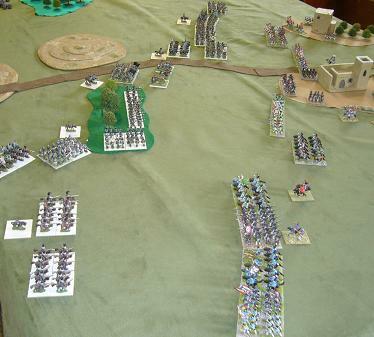 On the more open part of the battlefield, the French veteran infantry and cavalry advanced on the weaker Prussian wing. 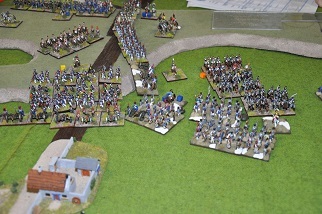 Well, it appeared to be weak until a glorious Prussian cavalry counter attack had the French in disarray. By the end of the game the Prussian cavalry had been routed, but not before sending the French divisions back to their starting positions. 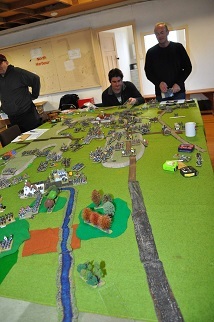 Neither side had managed to break the other or take their positions, but there was plenty of action in the game! This picture courtesy of the South Auckland Wargames Club, a snap I took whilst visiting them. At a previous NapCon convention in Hastings, a British Light Cavalry sabre was presented as the prize for the overall top Napoleonic player.